Asunción Lozano is an Amazonian woman that lives with her husband in the rural community of Nueva Vida. When you meet Asunción, her vibrant personality and positive energy are the first things that stand out. Her life at home, however, was far from vibrant or positive. Asunción’s marriage had been constantly plagued by a lack of communication that occasionally led to domestic violence. Many times, a woman like Asuncion is unable to change her life story. Fortunately, however, Asunción stumbled across a new radio program produced by Minga Peru called “Bienvenida Salud.” This radio program presented Asunción with both the opportunity and tools to change her story. In “Bienvenida Salud”, Asunción learned about many topics that were new to her — like women´s rights, reproductive health, communicable diseases, communication, self-esteem, domestic violence, conservation and eco-friendly income generating projects. In addition to becoming a regular Bienvenida Salud listener, Asunción also regularly wrote letters (that were delivered by boat) to the radio program producer, Minga Peru, asking for more information. Asunción also shared the radio program with her husband. As they listened to the radio programs together, Asunción and her husband started communicating better, they became more supportive of each other and the domestic violence stopped. While many people would have been satisfied with solving their own problems, Asunción wanted others to have the same experience. 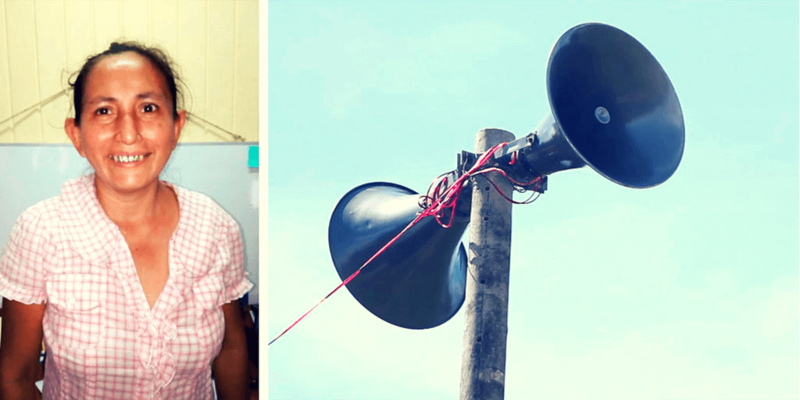 So, Asunción approached Minga Peru to see if she might be able to get loudspeakers installed in her community so that others without a radio could also listen to and benefit from the radio programs. Minga was able to raise the funds to purchase the loudspeakers and Asunción sought and obtained municipal authority permission to install the loudspeakers in the central plaza to publicly broadcast the program. Now, years later, the community still gathers in the central plaza to listen and discuss “Bienvenida Salud”. Today, using the content from over 40,000 listener letters (much similar to those sent in by Asunción), over 1200 Bienvenida Salud episodes have been created. These episodes provide critical information three times per week and reach more than 120,000 remote listeners from the Peruvian Amazon. Help empower other women like Asunción in the Peruvian Amazon.